What Causes Taste and Odor Problems in Drinking Water? Taste and odor are aesthetic qualities of drinking water and their measures are dependent on human perception. The sense of taste is a combination of responses from olfactory receptors located in the nasal cavity. The mechanism that controls odor detection, however, is much more sensitive and complex. Surface water supplies are more likely to be affected by substances causing undesirable tastes and odors. As a result, nearly all water treatment plants utilize chemicals or adsorbents to control these problems. Treating water so that it meets taste and odor standards set by the EPA (Environmental Protection Agency) makes up a significant portion of total water treatment costs. The types of odors in drinking water are directly related to the compounds present in the source water. Groundwater that is rich in salts and minerals often possess undesirable odors. Hydrogen sulfide (H2S), a dissolved gas which is characterized by a rotten egg odor, is also a common odor causing compound. Recently, chemical dumping, landfill disposal, and agricultural and industrial activities have contaminated groundwater supplies, increasing odor problems in drinking water. For example, phenolic or medicinal odors can often be detected in drinking water that originates from industrial rivers. The most significant source of odor in water supplies, however, is the growth and decay of microorganisms in surface water. Blue-green algae, green algae, diatoms, and flagellates are the four algae groups responsible for the most common odor complaints. Geosmin is an odor causing metabolite produced by blue-green algae, which possess an earthy, musty smell. Moldlike bacteria called actinomycetes are also present in surface water and produce MIB, another common odor compound. 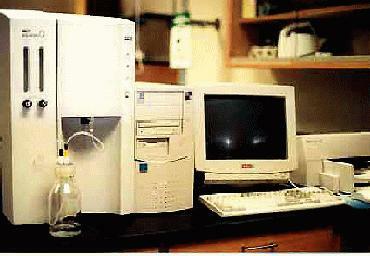 Inorganic compounds are the main source of unwanted tastes in drinking water. Ferrous and manganous ions (Fe2+ and Mn2+) are often present in surface waters due to the mixing and pH changes that thermal stratification and oxygen depletion cause. These ions, when present in sufficient concentrations, produce metalic tastes in drinking water. Chlorine added at the treatment plant for disinfection, however, is by far the most common source of complaint, as it has an extremely distintictive taste. where A is the volume of the sample tested and B is the volume of the distilled dilution water used. 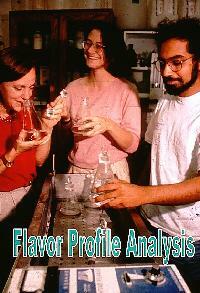 Flavor profile analysis, however, is a very subjective method due to the human error involved. As a result, these tests are mainly used to determine overall trends and taste and odor origins so that corrective measures may be applied. Once flavor profile analysis has been performed on a particular compound, the data can be organized for easy interpretation into a Weber-Fechner plot. This graph displays the mean intensity of the odor recorded by the flavor analysis panelists versus the concentration of the substance. Recently there has been a movement toward the use of "mechanical sniffers", which are more accurate and unlike humans, can smell an unlimited number of samples. One such device is the Aromascan, which is capable of detecting odor vapors at concentrations much lower than the human nose. This is accomplished through sensors which are located on a ceramic cartridge. The combination of the responses of these sensors allows the Aromascan to interpret what compounds are present and if they are at concentrations higher than that of distilled water. Most taste and odor causing compounds exist in reduced form, making oxidation an effective means of removal. The most commonly used compounds for oxidation include chlorine, permanganate, ozone, and chlorine dioxide. Chlorine has been found to be very effective in removing low-level inorganic odors such as hydrogen sulfide. This technique, however, can become complex due to the need for air stripping or dechlorination. Chlorine is also effective with organic sulfides, disulfides, and mercaptans, but can accentuate the odors of algal bi-products, such as geosmin and MIB. The use of potassium permanganate (KMnO4) is especially useful in treating industrial and algal odors, but if too much is added, manganese dioxide (MnO2) will form and turn the water black. Ozone is another excellent oxidizing agent for taste and odor problems, although high dosages are required to remove industrial odors. As a result, it is mainly used to reduce natural aquatic odors. Also due to the fact that ozone quickly dissipates, it must be generated on-site at a greater expense to the treatment plant. Chlorine dioxide is successfully used to control algae and phenolic odors, but because of its high cost it is as not as widely used as other oxidizing agents. Like ozone, chlorine dioxide gas must be generated on-site and aqueous chlorine dioxide is too costly for regular use. Activated carbon adsorption is considered to be the most reliable method of taste and odor removal. It can be used in two forms, powdered activated carbon (PAC) or granular activated carbon (GAC). In the past, PAC was primarily relied on to remove common taste and odor problems, but increased industrial compounds have required the use of GAC. Powdered activated carbon doses commonly range between 3 and 15 mg/L. When relatively low doses are required, PAC is most effective when added immediately before filtration. However, for high doses, it is best to add PAC before coagulation so that removal can take place during sedimentation. 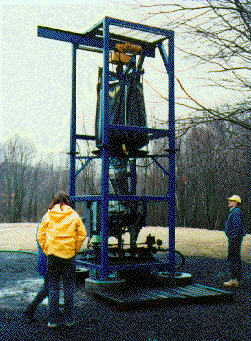 Powdered activated carbon being fed into reservior at Jumping Brook Water Treatment Plant, New Jersey. Aeration is only useful for the most easily removed substances such as sulfides or volatile organics. Groundwater supplies can be aerated to remove hydrogen sulfide and ferrous ion at low concentrations may be oxidized through aeration. Manganous ion cannot be effectively removed by aeration. Anebaena laxa and flavor profile analysis photos provided by Dr. Andrea Dietrich. All other algae photos and Weber-Fechner Plot provided by Dr. Diana Rashash. Rashash, Diana. Identification and Characterization of Odorous Metabolites Produced by Selected Freshwater Algae. Virginia Polytechnic Institute and State University. Blalcksburg, VA, 1994. Water Treatment Principles and Design. James M. Montgomery, Consulting Engineers, Inc., 1985. Zoeteman, B. C. J. Sensory Assessment of Water Quality. Pergamon Press. New York, 1980.